Use on unpolished surfaces including Flagstones, Flamed Granite, Limestone, Marble, Quarry Tile, Sandstone, Slate (Riven and Semi Riven), Travertine and Victorian Floor Tile. 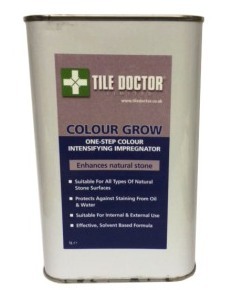 Colour Grow is suitable for both internal and external applications and recommended for areas where no damp proof course is evident. 2.) 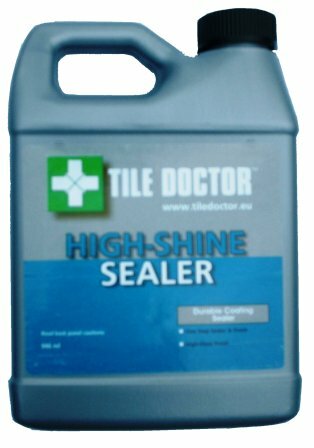 For new installations sealer can be applied as soon as 48 hours after grouting. 3.) Surface must be clean, dry, and free of existing sealers or coatings. 4.) Apply first coat using a paint pad applicator and leave to dry for 10 to 15 minutes. 5.) Polish off excess using a dry cloth. 6.) Repeat as required waiting 30 to 40 minutes between coats. 7.) Use a water test to determine if further coats are needed. A single 1 Litre bottle will cover approximately 15 m2 to 20 m2 (150 to 210 sq. ft.) depending on porosity, type of surface, temperature, humidity, and method of application. Two coats of sealer should suffice on most floors tiles including denser materials such as Flamed Granite and Smooth Sandstones, a further coat may be required on rougher uneven surfaces and porous stones such as Slate, Flagstone, and Limestone. Clay type tiles will require more coats depending on porosity. 1 Litre bottles £29.00 each. Post and Packing £7.50 (Incl.VAT) for 1 item, £10 (Incl.VAT) for two or more items. 5 Litre bottles £125.00 each. 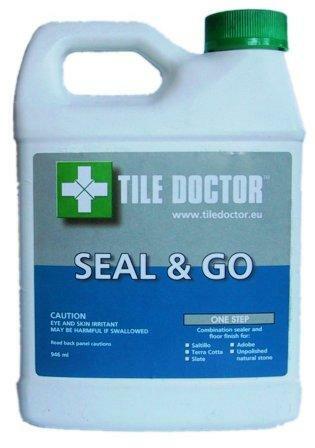 ♦ Do not allow sealer to come in contact with any non-recommended surfaces. ♦ May slightly darken some stone surfaces. ♦ Sealer will not prevent surface wear or etching from acids or caustic chemicals. ♦ Close container tightly after each use. ♦ Store in original container only. ♦ Store and use in temperatures between 4°c and 32°c (40°F and 90°F). ♦ Dispose of residue or any unused leftover product in accordance with applicable government and local requirements. ♦ WARNING: FLAMABLE. Keep away from heat and open flame. ♦ Avoid release to the environment, do not empty into drains, dispose of this material and its container at hazardous or special waste collection point. ♦ Use in well-ventilated areas. ♦ Avoid prolonged skin contact, repeated exposure may cause skin dryness or cracking. ♦ Wear suitable gloves and goggles. IF INGESTED: Seek medical advice immediately and show product container or label. EYE CONTACT: Flush with water. If irritation persists, seek medical attention. SKIN CONTACT: Wash immediately with soap and water. If irritation persists, seek medical attention. INHALATION: Relocate to fresh air. If symptoms persist, seek medical attention.